Recently I did a post on main places to explore and things to do in God's Own Country - Kerala and one of the followers mentioned on Facebook that it's unfair not to mention food of Kerala. 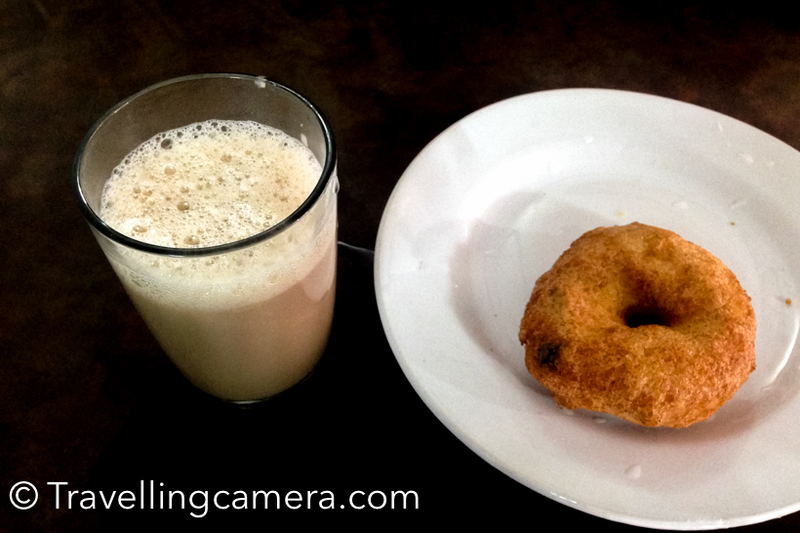 And I agree, so thought of compiling this post about Food of Kerala. 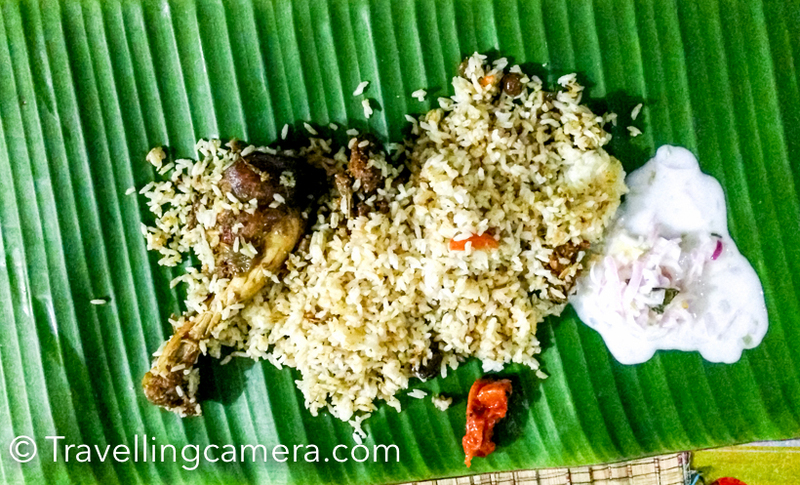 I am sure that some of the following names would sound familiar - Puttu and Kadala Curry, Thalassery biryani , Appam with Stew, Dosa Ghee Roast with Kerala styled Sambar , Idiyappam with Egg Curry, Spicy Chicken Fry (locally known as Nadan Kozhi Varuthathu), Kerala Prawn Curry, Mussel Stir Fry (popularly known as Kallumakkaya Ularthiyath ) , Pumpkin (Erissery) and Lentil Stew, Naadan Beef fry or Kerala Style Beef Fry and Malabar Parota, Kerala style Fish Molee and Kerala rice(boiled rice) along with sambar, parippukari with ghee, pachadi, kichadi, aviyal, puliyan, kuttukari, Kalan, Olan, Injikkari, rasam, pappadam, pickle, raita, sweetners(two or three different types), payasam. I clearly remember the Theayyam feast we enjoyed at Kannur. After spending whole day at Theyyam temple, one of the priest invited us to join for the feast. 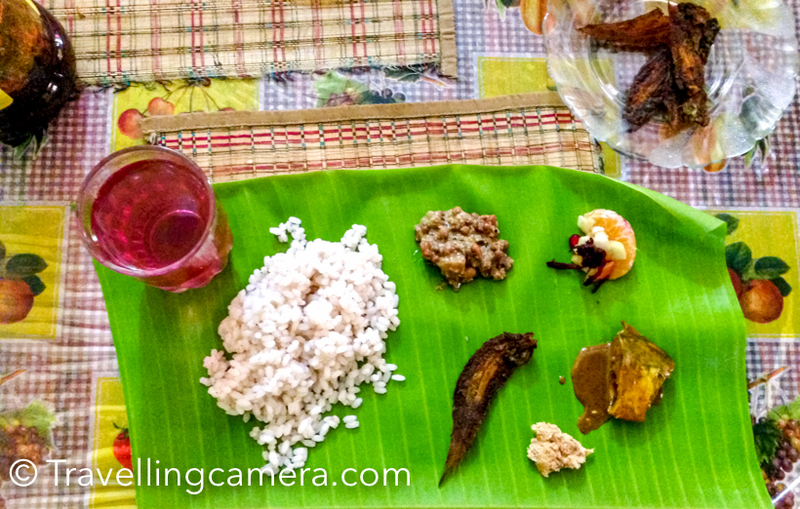 Everyone is invited to have lunch at temple and some of the popular food items are served on banana leaf. The same day we were wondering about the banana trees which would have lost those leaves. Hundreds of folks had lunch at the temple during Theyyam festival. Whenever anyone talk about Kerala food, that feast come to my mind. 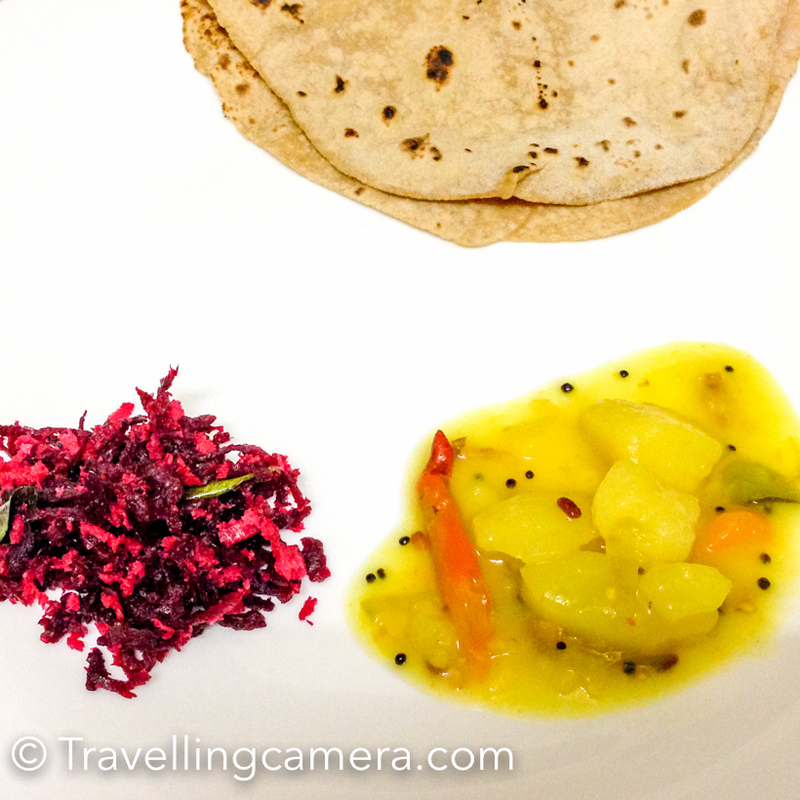 So my recommendation is to find a community event where you can enjoy authentic Kerala food. 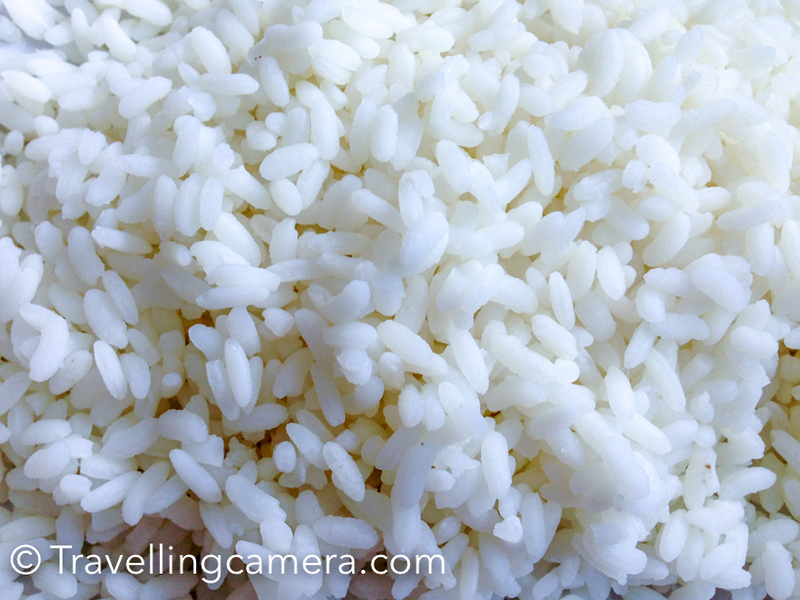 If you have visited Kerala you would know how Kerala rice look like and if not, just have a look at above photograph. These are very light as compared to rice we get in North India. If you are visiting Kerala, it's recommended to buy some spices to bring back home for family and friends. 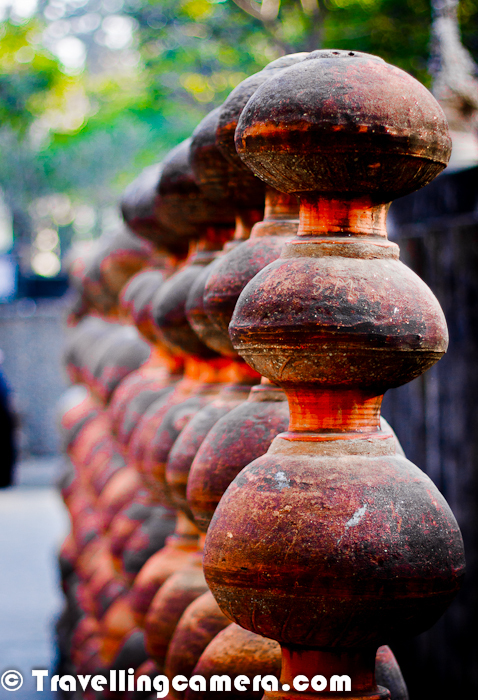 Patimugam is something which we liked and bought in abundance. The pink colored water served with food is basically boiled water by putting Patimugam in it. 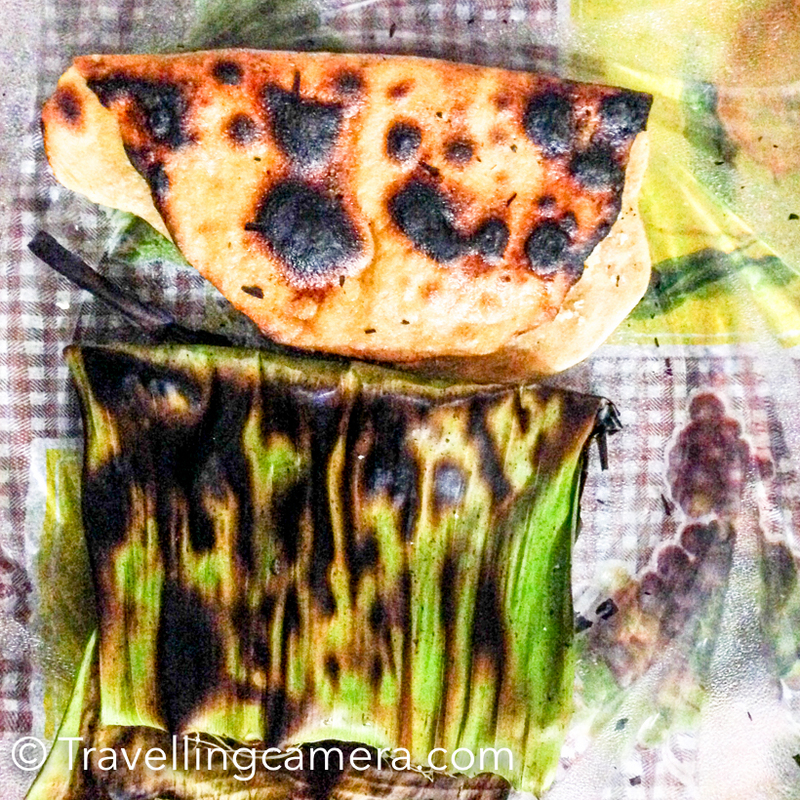 Travellers very well know that food of any place is very much inspired by it's weather and local ingredients. 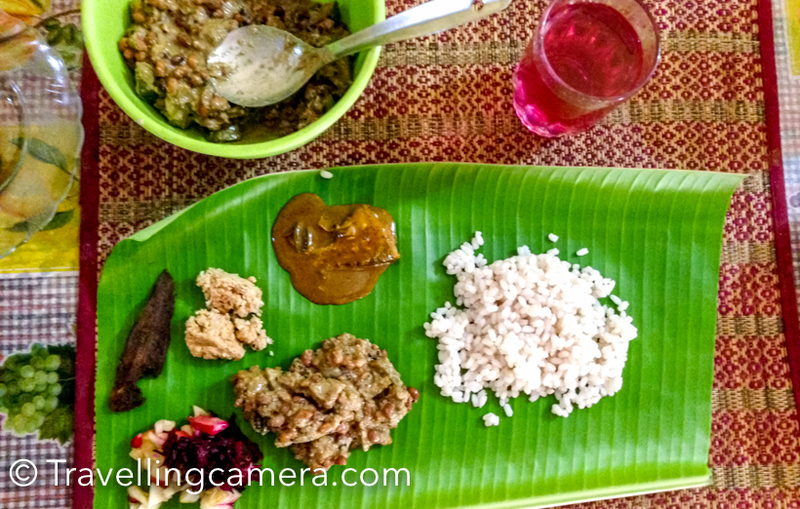 You can very much guess the major ingredients of Kerala food. Coconuts grow in abundance in Kerala and hence coconut cream & coconut milk are widely used in dishes for thickening and flavouring. 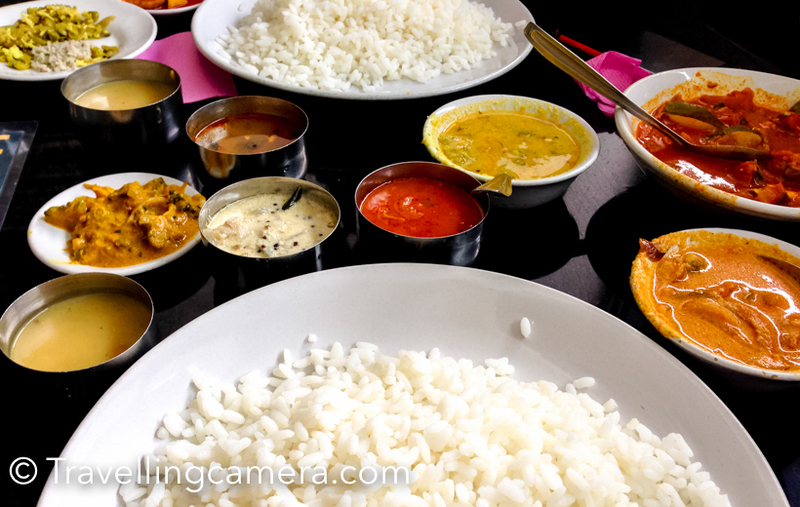 Owing to the weather of Kerala and the availability of spices, the Kerala cuisine is richly spicy especially the hot ones - chilli , black pepper , cardamom , cloves , ginger and cinnamon. Kerala's long coastline, various rivers, backwaters and strong fishing industry have contributed to many sea & river food based dishes. Rice and cassava (Tapioca) form the staple food of Kerala. 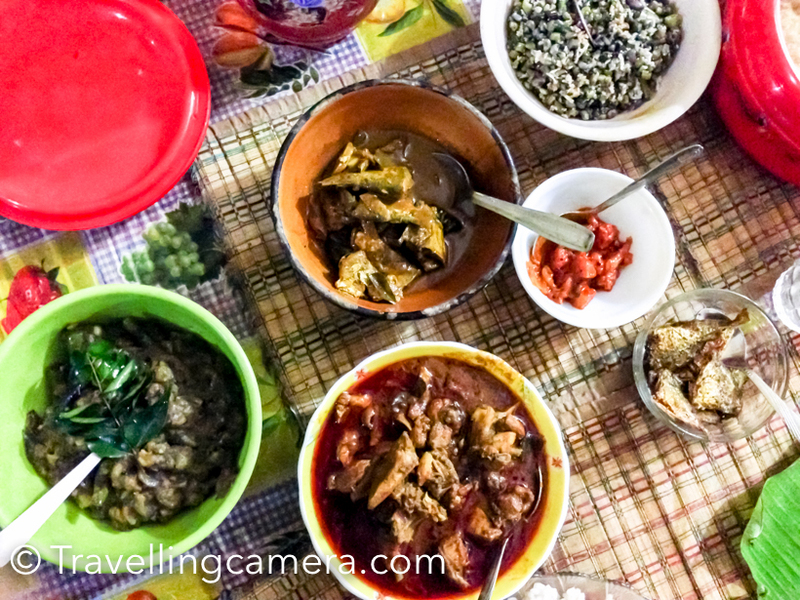 All main dishes are made with them and served along with Kootan; the side dishes which may be made from vegetables, meat, fish or a mix of all of them. The main dish for lunch and dinner is boiled rice. If you love cooking and prefer healthy food for your family, you may want to check this brilliant blog by Sangeeta. And here is a recipe for Chicken stew Mughlai Style. 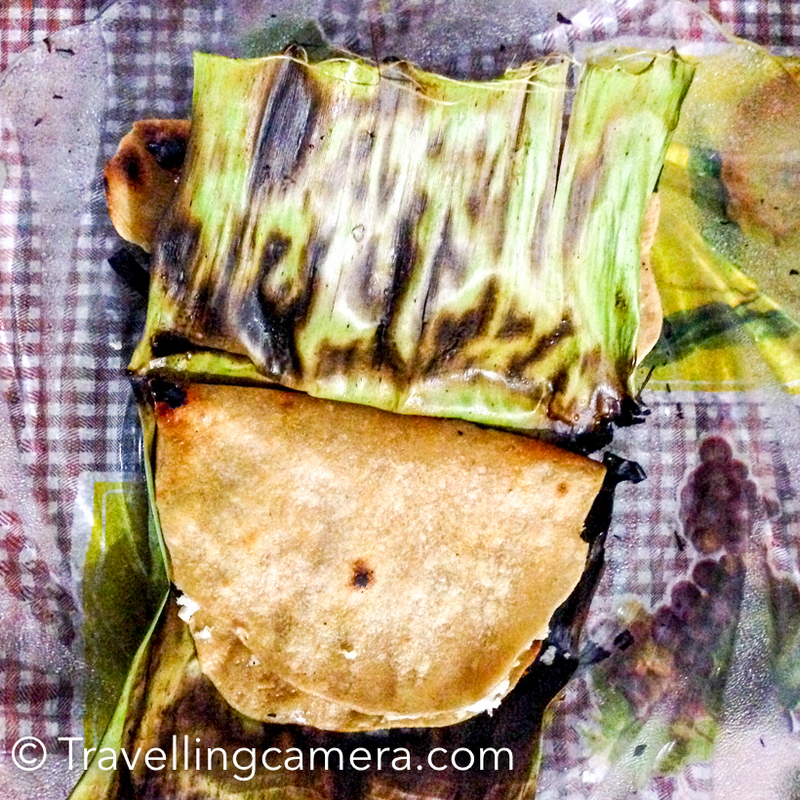 Let me give another tip to fellow travellers for exploring authentic food of Kerala. 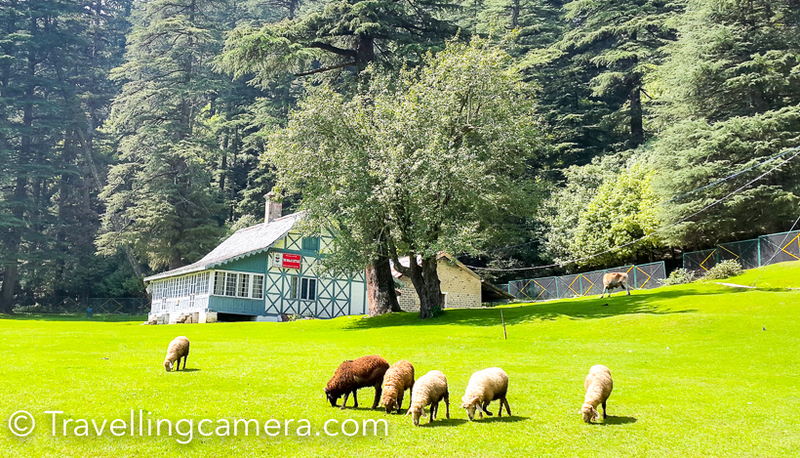 Prefer staying in Home Stays and do proper research. 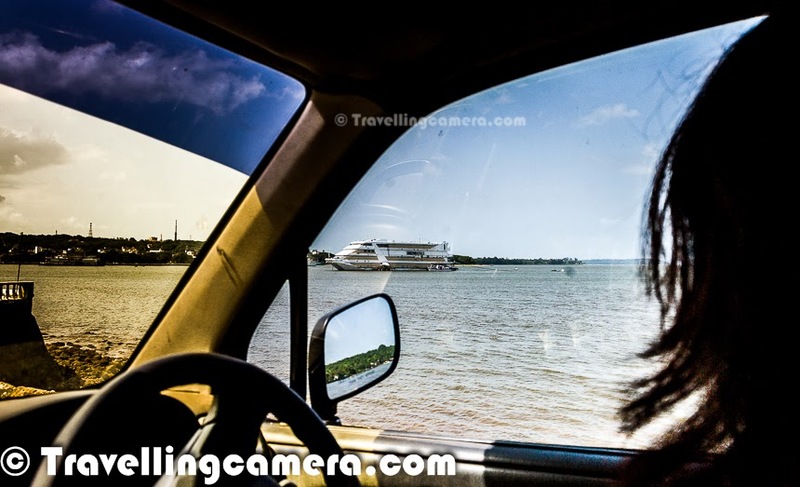 We were lucky to have great experience of home stays in Kerala. 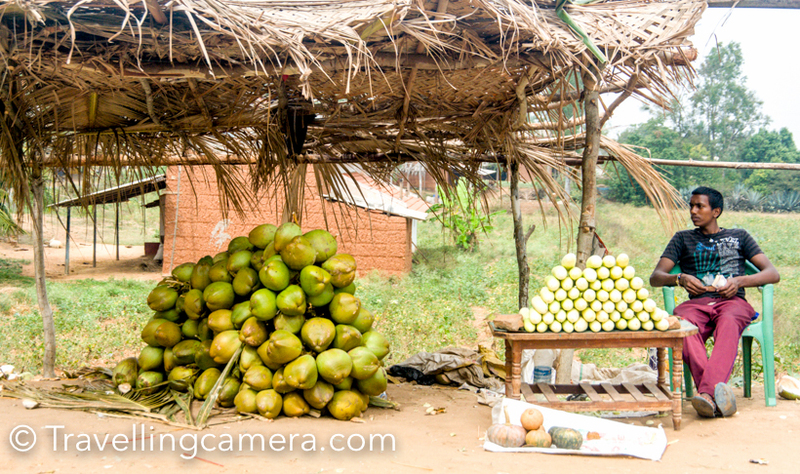 If you plan to explore Wayanad, here are 2 recommendations - Treasure Trove and Bamboo Village. 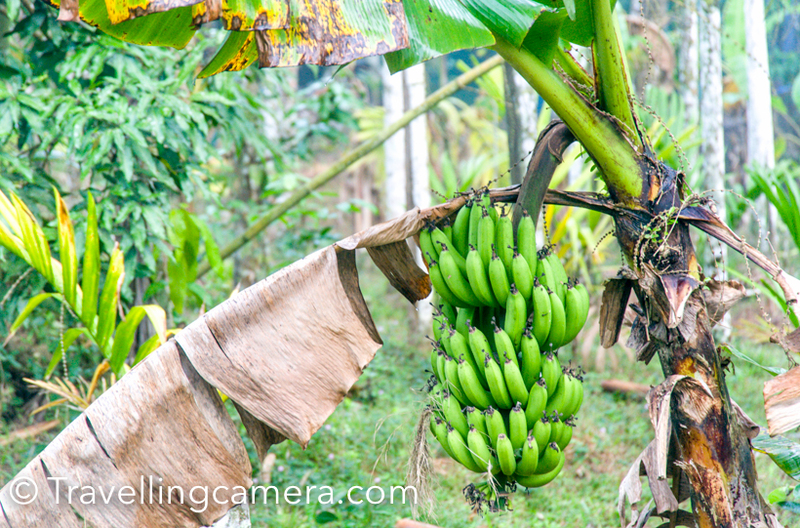 As you can see, banana leaves are used in different forms. Apart from serving food on banana leaf, it's also used for cooking. 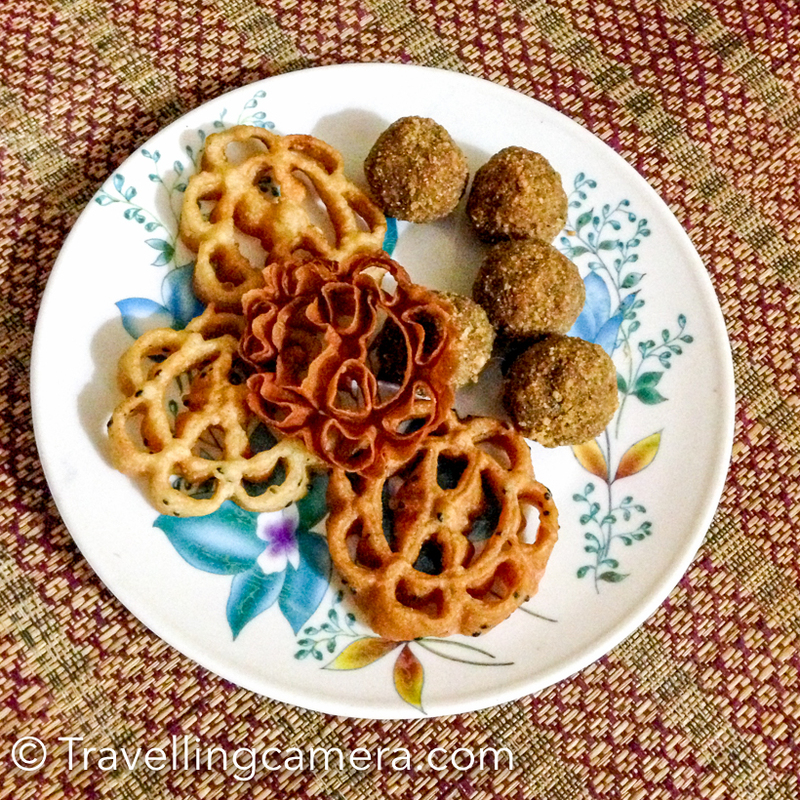 At our homestay, we used to get home cooked snacks with evening tea. What an awesome stay it was. 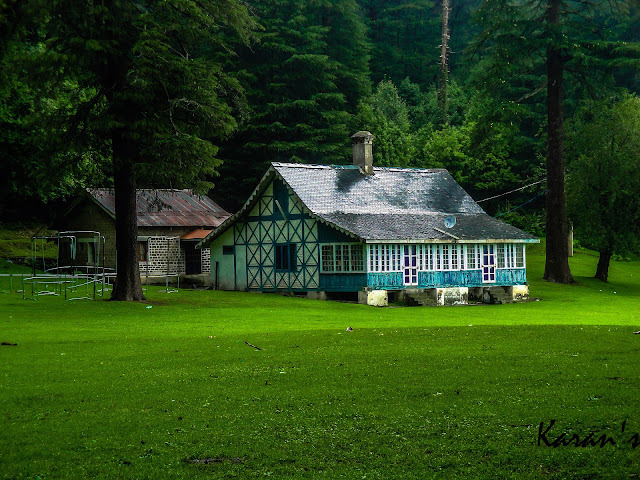 I wish to go there right now. Non-veg was main part of all our meals at Kerala. I found it interesting when fish and chicken vendors sell various types of fish on bicycle. While staying at Bamboo village, we met some vendors who were selling 4-5 types of small fish and almost every villager was buying fish. 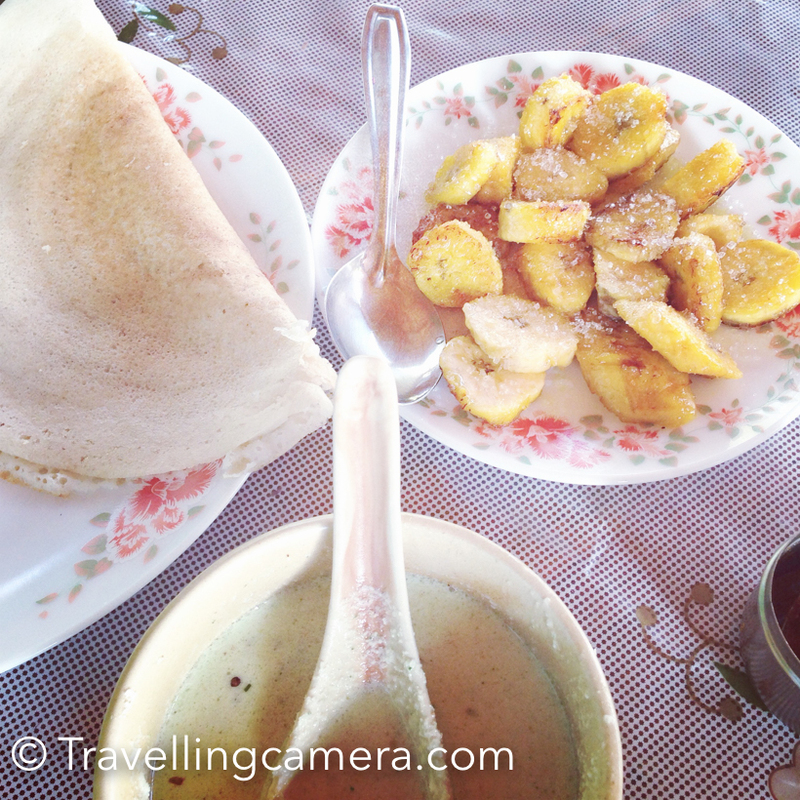 Banana is other main ingredient of Kerala food. In fact, unripe banana are also used in various ways. Banana pakoras, boiled banana, banana chips etc. I am sure that banana must be used in 10 other forms in Kerala. I didn't like boiled banana which was served to us in breakfast. Either I ate it in wrong way or I could relate to it's taste. 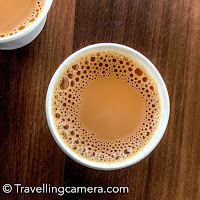 Having tea is another interesting experience at Kerala. 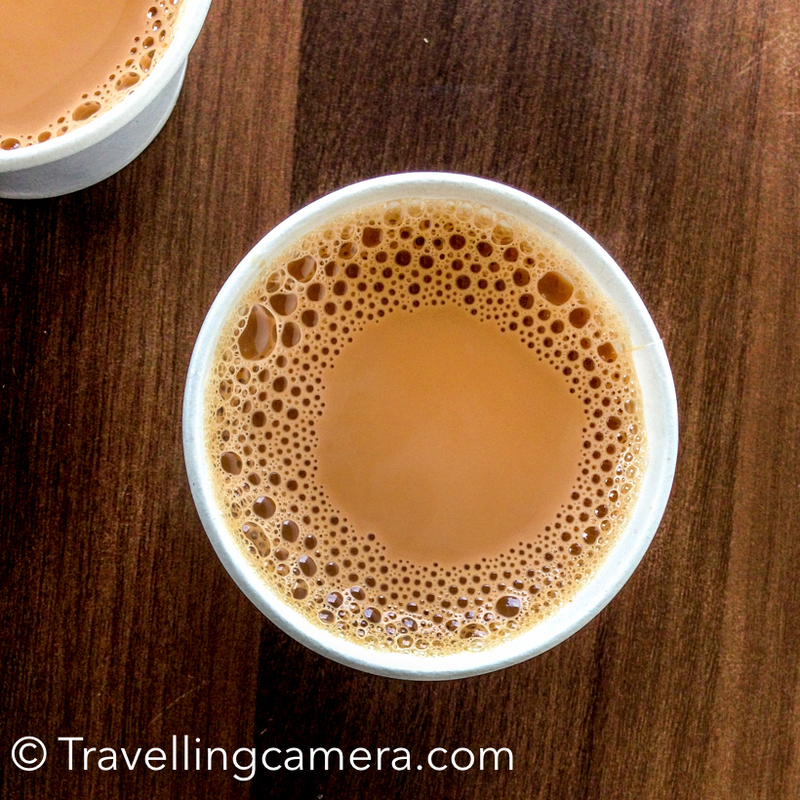 While driving from Wayanad to Kannur, we stopped at a tea shop which was selling almost 25 items to tea. It's impossible for me to name all those items but I chose bada and loved it. I had clicked a photograph of menu, but lost it somewhere. I will try to search again and add that here. Doing shopping at Kerala can be an interesting experience. 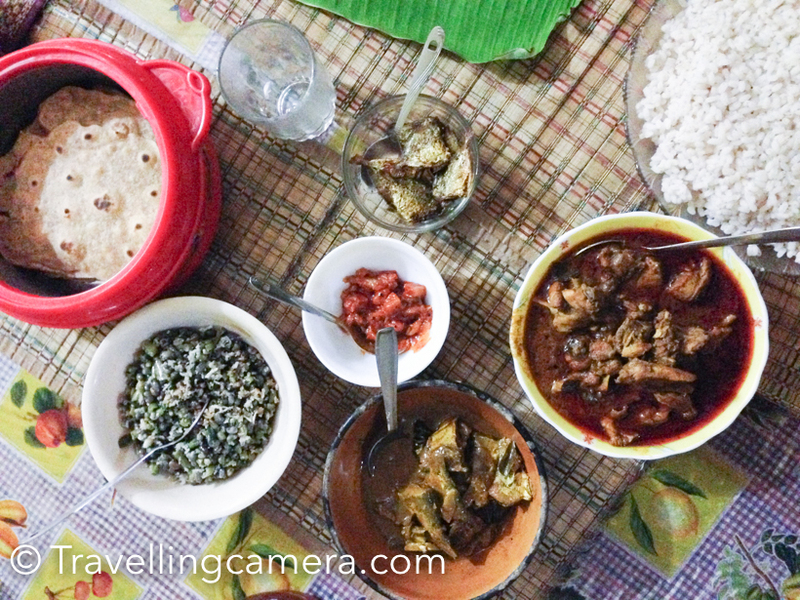 During our stay, one of the homestay owners asked us the fish we would prefer in lunch. He was going to the market and wanted to ensure that he buys the fish which we would enjoy. 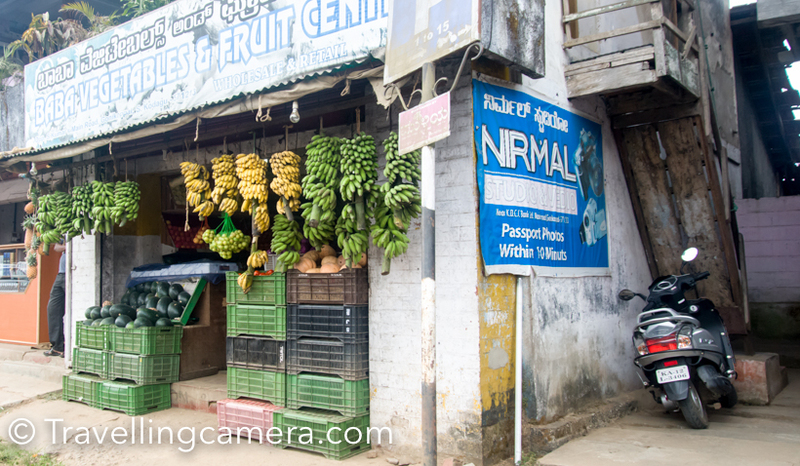 It was good to know that good variety of food items is available in smaller towns as well. We accompanied him for the shopping and impressed to see the kind of non-veg options available in Kerala. 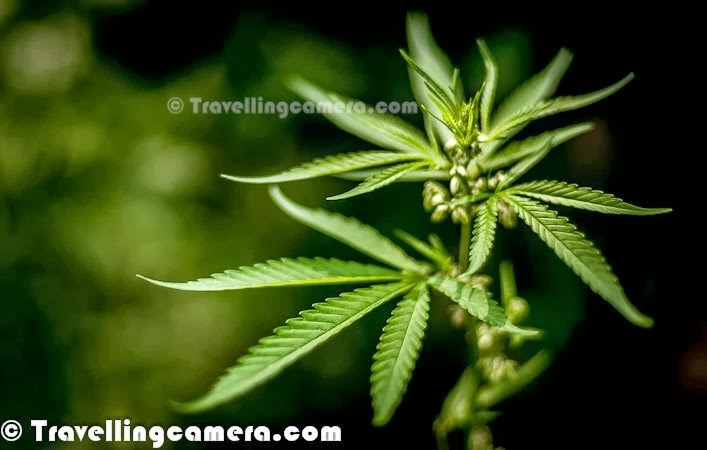 Since tourism is one of the main source of income for many of the folks in Kerala, variety of food is something that you can expect at most of the places. 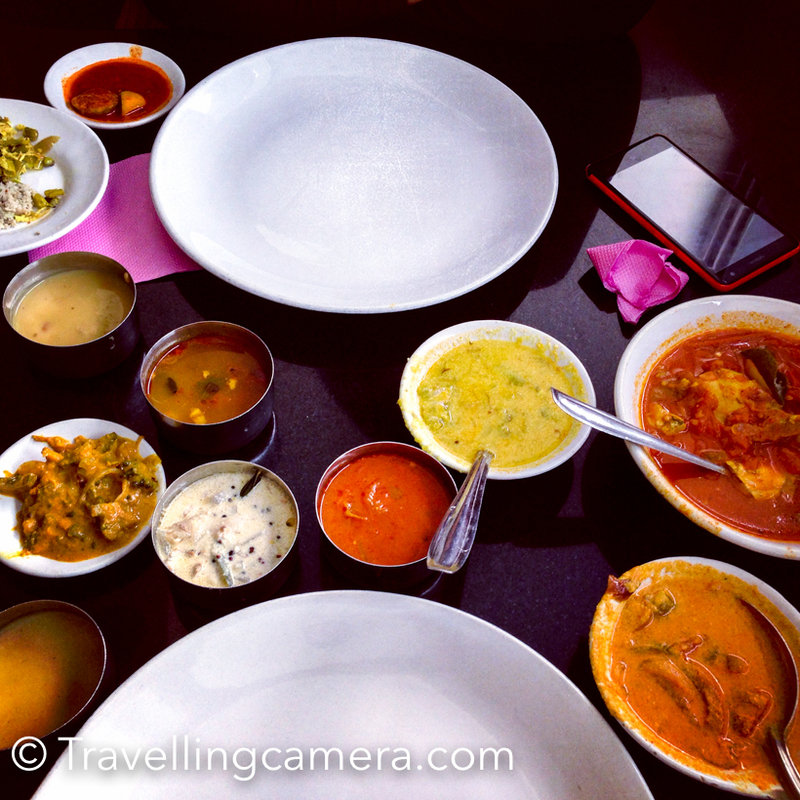 So if you are not sure if you would enjoy the local cuisine, it should be easy to find a place to stay which also offers other cuisines including north Indian. French cuisine is one of the other popular cuisines in Kerala and it seems that lot of french tourists visit Kerala every year. Now let's see how many of you can recognize food items shown in these photographs. If you know any, drop a comment with name and how much you like/dislike the dish. umm Yummy. 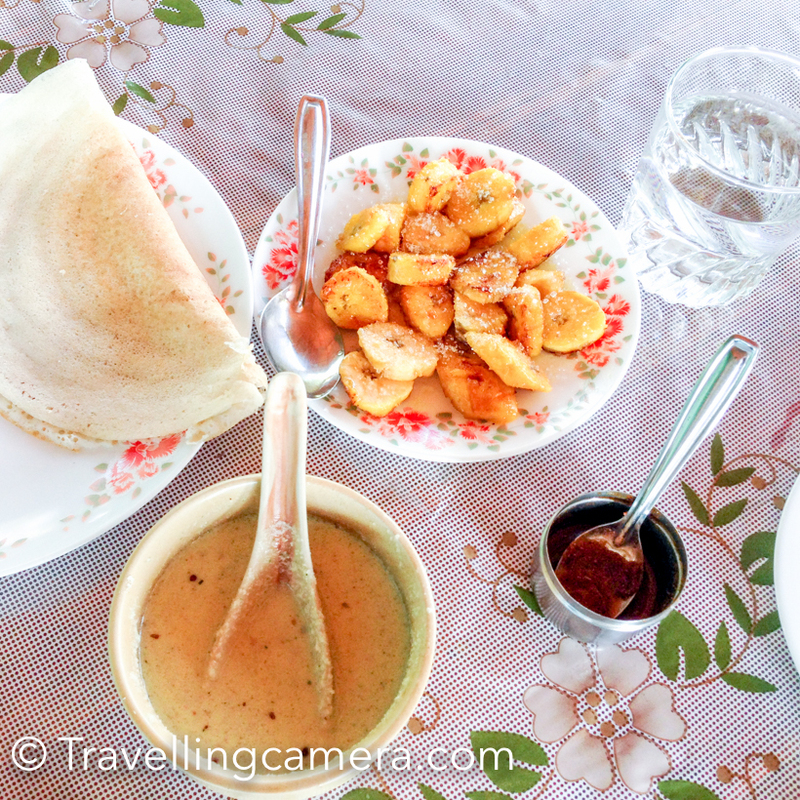 My favorite Kerala food are red rice, morkolambhu, chai, banana chips, appam, egg curry... mm the list is never ending. WHat a fantastic post and delicious pictures! Absolutely Arun. Its difficult to chart down everything in one post. Oh my! what a spread you have here. Looks like you tried a lot of good things from my home-state.